Daniel Ryan Cormier popularly known as Daniel Cormier is an American mixed martial artist and former Olympic wrestler, who is the current UFC Light Heavyweight and Heavyweight Champion and is ranked as the third best pound-for-pound fighter in the UFC. Currently, he is competing in the light heavyweight and Heavyweight division of the Ultimate Fighting Championship and is also the former winner of the Strikeforce Heavyweight Grand Prix. Daniel Cormier was born as Daniel Ryan Cormier on 20 March 1979, and this makes his age 38 years at this time. He was born to American parents, Audrey Cormier and Joseph Cormier in Lafayette, Louisiana, United States. He has an older brother named Joseph, a sister named Felicia and a younger brother named Feral. His father was shot and killed on Thanksgiving Day in 1986 by the father of his second wife when he was 8 years old. He is an American by his nationality and is of white ethnicity. His horoscope is Pisces. Even though it isn’t as thrilling or comparing as his fellow UFC and MMA companion, Conor McGregor, he still makes a massive amount of money through his fights. As of 2015, his estimated net worth was around $2,597,000. Daniel Cormier has an estimated net worth of $4 million in 2019, including all of his properties and earnings. As he is an MMA fighter, he doesn't receive fix salaries instead earns per fight. Recently Cormier was reportedly set to take home a major payday for his main event fight against Jon Jones on Saturday at UFC 200. Unfortunately, Jones was removed for a potential anti-doping violation, due to which Cormier's fight salary was cut in half. Cormier also made the highest earnings in UFC 2014 despite losing the fight against Jon Jones. Cormier earned $1 million while the winner Jon Jones made only $500 thousand. His total career earning is $5,616,500 as of January 2019. Daniel Cormier started his career as a wrestler. He wrestled during his high school. He participated and performed in several junior wrestling tournaments. During his high school, he was also voted as most outstanding wrestler state of the tournament. In 1995, he managed to win the bronze medal at the world championships in Greco-Roman wrestling. He has also excelled in football at linebacker position during his high school. He has a successful career in wrestling. He also competed at the 2004 Olympics. He also took part in the 2008 Olympic Wrestling. After the 2008 Olympics, he started his career as a mixed martial artist. Before landing his feet at the MMA, he was properly trained by Cain Velasquez, Jon Fitch, and Josh Koscheck at American Kickboxing Academy. On 3rd February 2018, The UFC heavyweight champion Stipe Miocic and UFC light heavyweight king Daniel Cormier came face-to-face for the first time and starred each other. 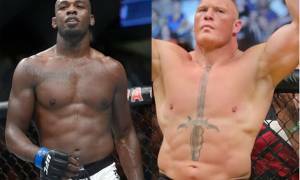 Subsequently, two competed for UFC Heavyweight Championship on 7 July 2018, at the super fight at UFC 226. Cormier won the bout and became the UFC Heavyweight Championship. On 3rd November 2018, at UFC 230, Cormier successfully defended the UFC Heavyweight Championship in a match against Derrick Lewis. Spotting some lights on his personal life and biography, Daniel Cormier is a married man. He tied the knot with his long-time partner, Salina Deleon, on 27 May 2017, among their family and friends. The couple is living a blissful life together. Salina gave birth to her first child a son named Daniel Jr. on February 16, 2011 and their second child, a daughter named Marquita Kalani Cormier was born on March 4, 2012. Talking about his past affairs, he and his unknown girlfriend had one daughter named Kaedyn who unfortunately died in an accident on June 14, 2003. Previously, he was married to Robin. The couple dated together for several years before they decided to get married. Unfortunately, their marriage did not sustain for a long period of time. Eventually, they divorced each other and the reason behind their divorce is not yet disclosed. His parents are Audrey Cormier and Joseph Cormier. He has a great physique and a physical appearance to endeavor it. He has a standard height of 5 feet and 11 inches. His body weight is 205lb.